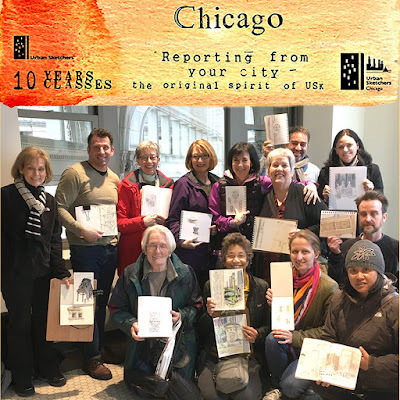 I will be part of a three-person team of sketch correspondents at the 8th International Symposium in Chicago (July 26-30, 2017) who will cover as many events (workshops, demonstrations, lectures and social gatherings) as possible, armed with only our sketchbooks, eyes and ears to record each day's activities. Each day we will attempt to divide and conquer by sketch-recording furiously the flavor of 36 workshops, dozens of artist demonstrations and lectures at the Symposium and by night composing, scanning sketches and blogging highlights from the day—reporting on our impressions of what we hear, observe and experience for those who were not able to attend the Symposium or could only be in one activity at a time. 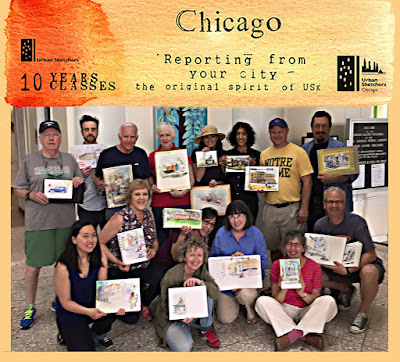 As an Urban Sketcher, I am often asked if this group is just a bunch of artists getting together to draw. 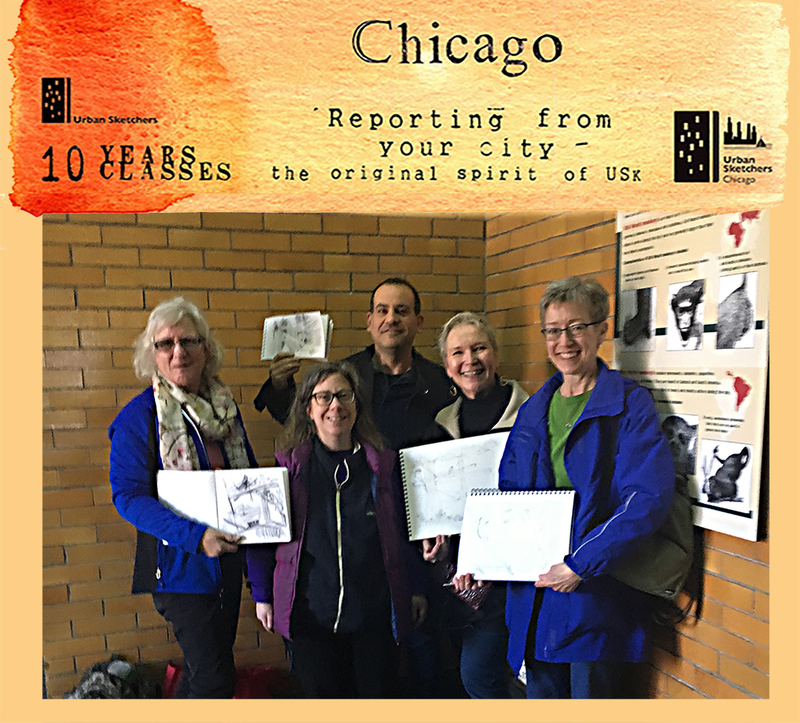 While it is true that we are a social group that enjoys sketching together, one of the most critical components of selecting a scene to sketch on location is whether the scene will make a great story to tell. The sketch serves as our prompt to relive the experience. I walked into Ed Hamilton's boutique pen shop, Century Pens located in the Loop by the [Chicago] Board of Trade, just over eight years ago, and have developed a wonderful friendship with Ed – a Prince among men – who has owned Century Pens for eleven years. Trained as an architect and hailing from the fair state of Indiana, Ed and I have spent many hours talking about pens, ink, penmanship, architecture, Chicago's history, politics, and tales of our wild youth. I got the fountain pen bug just before I met Ed, who recognized a potential addict the minute I walked in the store with a sketchbook in my hand and an assortment of pens peering over my vest pocket. Ed was every bit the enabler and fanned the flames of desire for this draughtsman whose fountain pen collection (I'm sure) passed the $11,000 mark several months ago. I recall talking to one of Ed's regulars whose collection was over 650 fountain pens. Century Pens has been the premier fine writing pen store in Chicago and one of my absolute favorites nationwide. Chicago lost Gilbertson Clybourne a couple years back and I fret Ed's age and the prospect that he may hang up the spurs one day. Today, I spent most of the day sitting in Ed's store, drawing, sharing take-out lunch, and shooting the bull with Eddie and Charlie. Online is in so many of it's convenient ways a poor substitute for the face to face, hands on, of the brick and mortar experience. Cheers Eddie. Drawn in a Tomoe River Paper sketchbook with Faber-Castell Pitt Artist Pens and a Pelikan M215 fountain pen with Platinum Carbon Ink. 10 X 10 = A Sketcher's Delight! The reviews are in, 10Years – 10Classes is the perfect way to celebrate 10 years of Urban Sketchers!